who has reached the time of death. Fortunate one of noble family, listen one-pointedly with mindfulness and no distraction. Whatever appears in this world is the dream-like deception of Mara. Everything impermanent is subject to death. These appearances are nothing other than yourself. Don't be afraid or shocked. Inner experience resembles a butter lamp in a vase. Remain one-pointedly in the clarity of non-thought. Rest naturally without fabricating or distorting anything. Noble one, in this way you will be liberated into dharmakaya. Fortunate one of noble family, listen with undistracted, one-pointed mindfulness. For the next seven days, all experiences will arise as rainbows, lights, rays, spheres and as the bodies of deities. 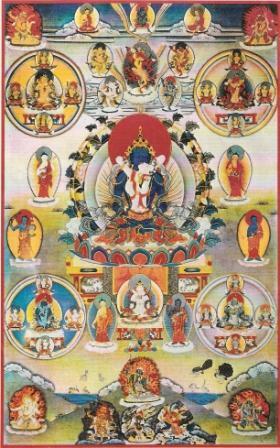 All are the magical display of the means and knowledge of the five buddhas. Do not be afraid or terrified by the brilliant colors and lights. Resolve that they are your own expressions. Together with these lights dull colored lights will also appear and attract your mind. Your experience will arise as pure and impure paths, so do not miss the right path to be chosen. This is the great, direct path of Vajrasattva. maintain the state in which the appearances of deities are inseparable from yourself. At that time, as one deity dissolves into another, you will be liberated into sambhogakaya. Listen fortunate one! If you are not liberated now, know that time does not change though phenomena does. amidst a roaring mass of flames and rainbow colors is the Great and Glorious Heruka. His assembly of deities and terrifying attendants rain down sharp weapons, HUNG, PHAT and laughter. Without being afraid or terrified, recognize everything as the display of your awareness. Be firm in this and rest while mingling inseparably with the natural state. Having entered the path, you will be liberated. In this way, those of the,middle capacity are liberated. Maintain mindfulness and do not be distracted. Your body is now comprised of prana and mind. Around it theappearances of the bardo of becoming arise. Knowing you are dead, you long to be alive. You are caught by the fierce servants of the Lord of the Dead. Frightening sounds and steep defiles appear along with many definite and indefinite signs. All this is the manifestation of your mind, which is ultimately empty like the sky. the food of undefiled liberation through hearing. Partake of it, and without attachment to being alive turn with longing to your yiddam and master. Whoever recalls his name will be born there. You, too, while recalling his name, should make prayers. Free of doubt, move with a spontaneous vajra leap. In that buddhafield, within the hollow of a lotus bud, you will be swiftly and miraculously born. Therefore, noble one, with delight and joy give rise to devotion. Since you have not closed the door to the womb, when you see a log, a hollow space, a dark place, a forest or a palace, abandon desire and clinging. Make up your mind to be born on the earth and specifically in Tibet, in the presence of your teacher. Visualize your future parents, from a religious family, as Guru Rinpoche and his consort. Abandon desire or anger, and with faith enter the state of composure. Having become a vessel for the profound Dharma, you will swiftly attain wisdom. Through these gradual instructions, no matter how low one’s capacity may be, one will certainly be liberated within seven rebirths. Draw the session to a close with the dedication and aspiration prayers and rest in the natural state of the pure nature of all phenomena. A deeply profound instruction such as this does not require cultivation, but liberates through hearing. Written long ago, it is best to be born in the same area as your Guru. This teaching was extracted from a text in Vol. 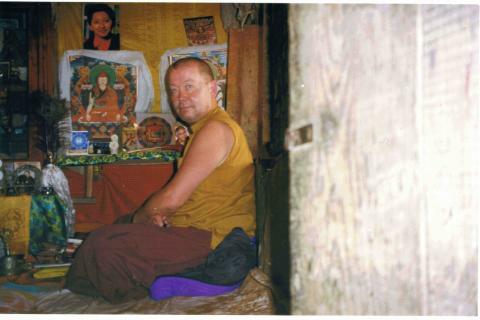 1 of the Chokling Tersar, called Sheldam Nyingjang, The Essence Manual of Oral Instructions.